This summer I have the pleasure of being a Solution Sales Specialist for IBM. So far, I am head over heels for my internship! 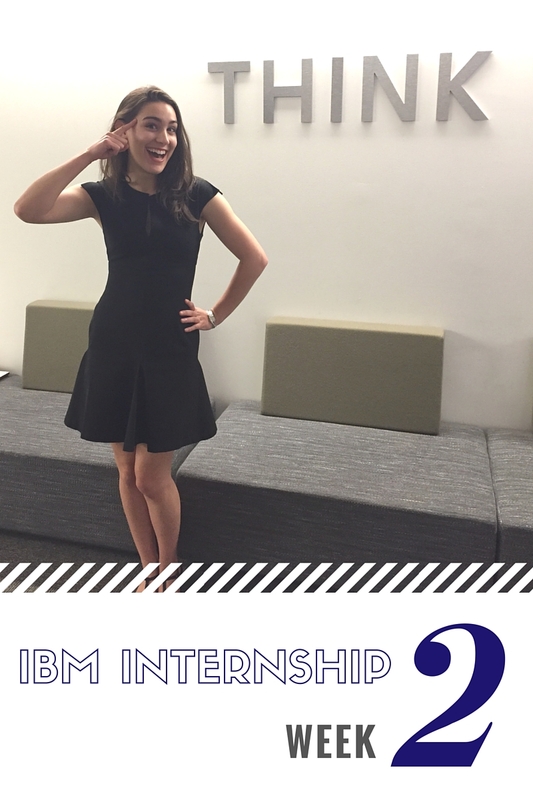 Naturally, I made sure to incorporate blogging into my experience and have been writing and publishing within IBM. Today I thought I would share the two posts I've written thus far (that makes this a bit long, but it's worth it, I promise!). I'll share on Tuesdays my experience of the previous week. It's been overwhelming to keep up with this blog, some work I do on the side, and my internship, so Tuesdays will be my opportunity to kill two birds with one stone. Don't worry, there will still be posts on Thursdays as well :) Enjoy! Beep. Beep. Beep. My alarm was going off at 3:30am on Wednesday, May 25th. Why was I waking up at this rather ungodly hour? To catch a flight to Dallas for training for my IBM summer internship. While it was tough to drag myself out of bed, it was so worth it. Many hours later, I pulled up to the IBM office where I would spend the next three days. After signing in and taking care of the menial paperwork, the fun began. 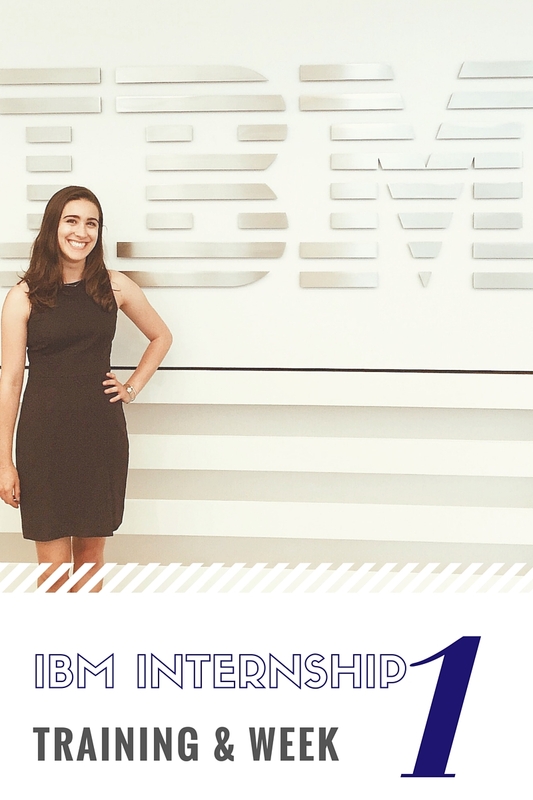 I explored the offices with another Summit intern, as we discussed why we chose IBM and what we hoped to get out of the summer. Before long, I was meeting so many new people (there were 61 of us at training!) and might have been getting only slightly weary of saying where I was from and where I would be interning. We were kept quite busy for those three days with presentations, and tours, and workshops. Although I didn't have a better idea of what the day to day activities of my internship would be, I was filled with excitement and anticipation for the next 10 weeks. Going to the airport with my new intern friends was great fun, until we were delayed. And delayed again. And delayed AGAIN (at least it inspired me to write this post all about airport etiquette). Ultimately, I made it back to my house at 1:30am the next day and was grateful to have the long weekend to recover. Sunday night was spent ironing my clothing, packing my bag, and thinking about what might lie ahead. Taking the train into the city and emerging from Penn Station in my suit and heels (which I would quickly learn were not the best walking shoes. Cue: trusty commuting flats) made me feel like I was in a movie. Off I went to an action packed first day meeting recent Summit graduates, getting to know the hub manager, requesting access to more resources than I could wrap my head around, joining fellow IBMers for lunch, and getting my bearings in the city. The rest of the week didn't slow down from there! Highlights included visiting 590 Madison and spending time with recent Summit graduates, learning about my work plan, and sitting in on meetings. Perhaps the best part was when my host manager unknowingly made my day by suggesting we get Indian food for lunch, which is my favorite type of cuisine! Training and week 1 were certainly a success. Looking to next week, I plan to get to know the Software Client Leaders (SCLs) on my team better and identify the places I can be most helpful, as well as delving further into my work plan. Stay tuned! "All the problems of the world could be settled easily if men were only willing to think." Classic Watson, right? Next week perhaps I'll share a more unique quote, but I had to go with this one because of the photo. This was the first full week of my internship and I am absolutely loving it. I love working in a professional setting. I love interacting with talented people. I love the opportunity to ask questions. I love being in the greatest city on earth. I love seeing what it is like to be a sales person. It's not all glamorous (don't get me started on the blisters heels can give you), and it certainly isn't all easy (I'm not prepared to admit how turned around I got looking for the subway entrance and how long it took me to get into any sort of swing with initial prospecting), but it is all what I want to do. This week I got to start from the ground up with an assignment from my host manager. He asked me to create a 30-60-90 day plan for a client by pretending I was the new Software Client Lead (SCL). "Let me send you an example of a plan," he said, turning to his computer. "Actually, never mind. Let's see what you come up with first. It'll be a good coaching opportunity," he decided with a smile. Off I went to Google 30-60-90 day plans and ultimately take my own stab at it. When we went over it, we were both pleased with the outcome and made some adjustments so I could see the best way to approach having a new client. Now, on to the prospecting. Oh, prospecting. In case you have never done it before, let me give you an analogy and explain what is involved. Imagine you are on the show The Amazing Race. You are in a foreign country where you can't speak the language (the resources at IBM that you have no experience with), and you have to find a certain restaurant (the company), on a particular street (the department), with a menu (the variety of roles in the company you are looking for), a unique dish (the people in that department), with a few ingredients (the people who will actually be interested in what you have to say), and you have to identify the exact ratio of ingredients in a given bite (the email of that person) and tell Phil Keoghan (the host of The Amazing race) what it is. In the foreign language. That is what it's like to prospect. Basically, it's a big hunt where you do your very best to amass a large amount of qualified leads to set meetings with. I'm just getting started with the actual formulating of emails and will start next week trying to set meetings. Stay tuned to see how that turns out. A highlight of the week was attending a panel discussion, moderated by Marianne Cooper, the NYC Senior Location Executive. I was invited by one of the SCLs on my team, Kristin, who has been the very best with introducing me to others and telling me about interesting events. There were four other women on the panel who discussed navigating the changes IBM is going through as you grow your career. With a small audience, we were able to have an open dialogue that covered a wide range of topics. When the women were asked to share a defining career moment when they knew they "made it," I couldn't help but wonder what that might look like for me. I am the type of person who is always striving for more. This characteristic, while great for motivating me to work hard, is also a bit detrimental when I have an achievement but immediately begin to set my sights on the next goal. When I asked how they balance their ambition with celebrating and appreciating their success, the women all related to the challenge and said it came down to intentionally taking the time to tell themselves they did a good job and reflect on their accomplishments. A common theme was that our greatest assets can also be our greatest weaknesses. It is essential to focus on the positives while minimizing what may hold us back or create dissatisfaction. This week certainly motivated me to think and figure things out (I'm looking at you, prospecting). I met many new, helpful people and got a bit more acclimated to navigating the city. I'm looking forward to next week and sharing more experiences, quotes, and extensive analogies with you. Check back next Friday for installment number three and find out if I get any responses to my prospecting emails! Congratulations if you made it all the way to the end! Next week it will be half as long, so never fear.